Gerry Dawes's Spain: An Insider's Guide to Spanish Food, Wine, Culture and Travel: Food Arts, El Quencher: Mad dogs and Spaniards? How did the quintessential quaff of British colonials become a runaway hit in Spain? Gerry Dawes, aka Mr. Spain, reports. Food Arts, El Quencher: Mad dogs and Spaniards? How did the quintessential quaff of British colonials become a runaway hit in Spain? Gerry Dawes, aka Mr. Spain, reports. The Ultimate Gin & Tonic has turned up in a globe-shaped glass on the bar at The Bazaar by José Andrés in the SLS Hotel in Beverly Hills. Not in a lounge that recalls the days of the British rule in India. at Bar Blanca at The Bazaar by José Andrés at the SLS Hotel, Beverly Hills. Photo by Gerry Dawes ©2012; contact gerrydawes@aol.com for publication rights. Spain—and lately its high-flying vanguard of chefs—has long had a love affair with Gin & Tonic, or “Gintonic,” as they call it. Who knew? 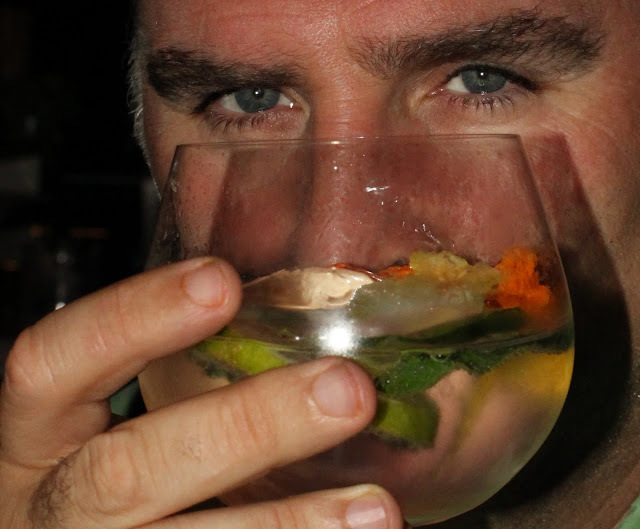 No wonder, then, that the proliferating tapas bars in the United States are introducing Gintonic menus. Estadio, a Spanish restaurant near Logan Circle in Washington, D.C., mixes Old Raj Gin with house-made orange thyme tonic and Tanqueray 10 with house-made elderflower citrus tonic. In Brooklyn, New York, Cynthia Diaz’s Bar Celona celebrates “Spain’s most popular tipple” by using artisanal gins, house-made tonics, and nontraditional ingredients: The Sea Monkey calls for Death’s Door Gin, house-made celery/apple juice, lemon, anise, Fever Tree Tonic, and fennel salt; El Matador has spiced gin, house-made tonic, cava, and bitters. Andrés’ newly renovated Jaleo Restaurant and Tapas Bar in Washington, D.C., will likely outdo them all. His ThinkFoodGroup lead bartendar, Owen Thomson, has a Gintonic menu that includes Death’s Door and Fentiman’s Tonic with fennel, radish, cubeb, and kumquat; Ransom Old Tom and Bittermen’s Tonic with pickled ginger, allspice, orange, and lemon; Ridge Silver Tip and Fever Tree with tarragon, lemon, lime, and borage; Botanist & Q Tonic with coriander blossom, lemon, and lime; and Tanqueray 10 and house-made tonic with grapefruit, mint, lemon, and white pepper. Since a Gin & Tonic is a drink ostensibly made for hot climates, many people have been drinking it—most often gin with Schweppes Tonic and a twist of lemon—for decades in Spain, where more than 200 brands of gin are sold.